I am aware of the Toyotomi campaign in Korea but I was pleasantly unaware to the extent of the construction of so many castles in the attempt to defend the Japanese held territory in Korea. Lets look a bit more at the Toyotomi Hideyoshi campaign back in the 16th Century. The seven year Imjin War at the end of the 16th century was East Asia’s largest ever engagement of troops. 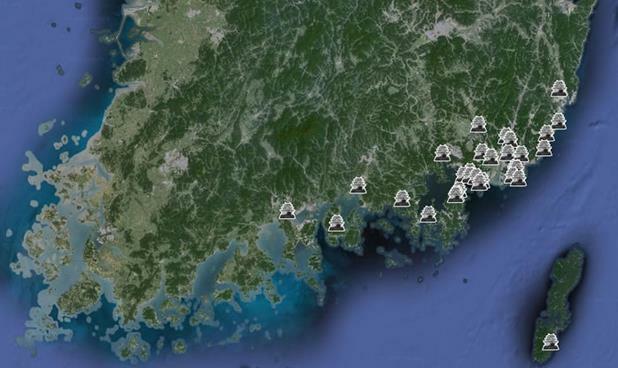 After quickly capturing Busan, Japan’s scorched earth policy laid waste from here to Pyongyang until Ming Chinese forces entered the war to protect their suzerain status over Korea. This forced the Japanese troops to dig in with a series of castles –remnants of which can still be seen today. BUSAN, South Korea — On the morning of May 23rd, 1592, at the order of Japanese general Toyotomi Hideyoshi, approximately 158,000 troops set sail from Tsushima, aboard hundreds of ships, for the port of Busan. It was the first of what would be the two major invasions of the seven-year Imjin War. After being rebuffed on numerous diplomatic missions seeking passage for his troops across the peninsula into China, Hideyoshi elected instead to first conquer Joseon Dynasty Korea before invading Ming Dynasty China. This time, it would be the Japanese using Busan to launch their attack on the Chinese homeland. Japanese troops arrived just after sundown, following a day-long journey at sea. Armed with Portuguese firearm technology and troops battle-hardened by years of civil war at home, the Japanese quickly routed the bow and arrow-wielding Busan forces before beginning the long march towards Seoul. Three months later, Hideyoshi’s troops controlled several strategic cities, while maintaining a vulnerable supply line from Busan to Pyongyang. Civilian populations were most harshly affected by the Japanese troop’s use of scorched earth tactics that sought to destroy nearly all in their path. Along with the strategically inept Joseon policy which forbade local commanders from engaging a foreign invasion force until a court-appointed general could arrive from Seoul with royal troops, Joseon additionally suffered under the weight of internal dissent by Koreans known as Baekjeong (Koreans of the lowest social rank; similar to India’s “untouchables”). Many Baekjeong viewed the Japanese as liberators from the harsh Korean feudal system and took advantage of the sudden loss of domestic security by setting fire to government buildings—including those where status ledgers for Korean slaves had been held. Chinese forces soon entered the conflict, intent on protecting their suzerain status over Joseon Dynasty Korea. As Kenneth Swope writes in the Sungkyun Journal of East Asian Studies, Korean rulers of the era had little say as to how their fate would play out between the two warring powers. Japan, following failed peace negotiations with the Ming Dynasty, invaded Korea for a second time in 1597. Hampered by the heroic efforts of Korean Admiral Yi Sun-shin and his fleet, Japanese supply lines suffered heavily during the second campaign. With large numbers of Chinese troops pouring in from the north, and Korean guerilla warfare activity, the Japanese were forced to expand construction of fortresses across the southeastern part of peninsula in an effort to maintain what they had captured. Over the course of the war, a total of 35 castles were erected, either from scratch or from the remains of conquered Korean fortresses. Of the 35 castles constructed by Japanese forces, little more than fragments remain of most. A great place to get an idea of the structures that once straddled the Korean coastal area is the Gijang Cultural Center just outside of Busan. There you can see a model of the Imrang Fortress, which stood on the eastern coast as the northernmost Japanese defensive post in what were a series of ten castles east of the Nakdong River in the Busan area. The castles built in Korea were similar to the Japanese mainland style of the 16th and 17th century, with towering stone walls and a command tower perched on top. The Imrang Fortress was erected on a hill overlooking the beach and it included a lower residence area around the port, though little of that remains today. Much like the Imrang Fortress, there are still bits and pieces of these 16th century strongholds out there for those curious to witness a page out of the Korean peninsula’s past. To see the most well-preserved castle, head further north to Ulsan for a tour of Seosaengpo. Built by Japanese General Kato Kiyomasa in 1592-1593 during the initial stages of the Imjin War, many of the original walls still remain intact. List of Castles in Korea and the time they were built. Source – Bobby McGill, Forgotten Castles. Next Post Kusado Sengen – Medieval archaeological site.